January 2018 Oral histories, critical perspectives and socio-political injustices against Iranian women are tackled through the visual language of the first generation American-Iranian artist and Brandeis University professor. 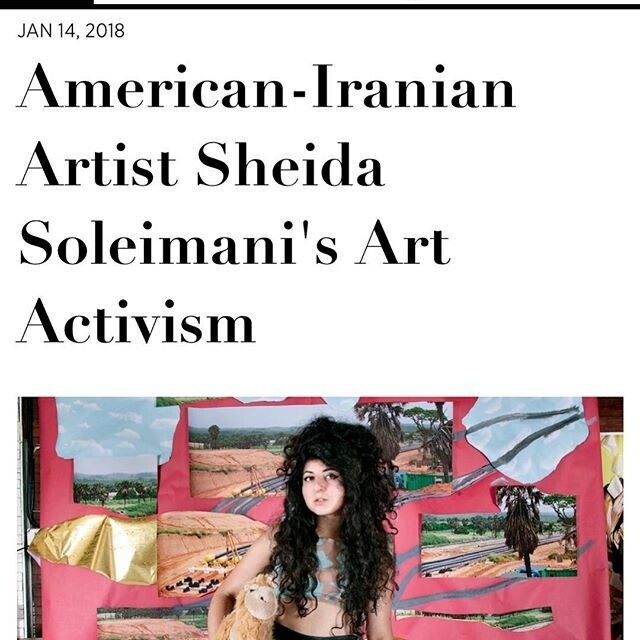 Sheida Soleimani is working to dismantle societal conditioning by pushing back against exoticism, clarifying Western interest in the Middle East, addressing forced repression versus willing religious choice of gender issues, and bringing female injustice to the fore. It is a complex load to bear, but her art activism is one means to confront concerns that need a long-term unified front, and one in which questions of meaningfulness, effectiveness, and audience, arise. Soleimani grew up in Cincinnati in what she has described as a relatively traditional Iranian childhood—but the relocation of her parents to the USA followed a volatile relationship with Iran that resonated strongly throughout her upbringing. Her political activist father was against the Ayatollah’s totalitarian regime and had to go into hiding for years before finding asylum, while her mother endured imprisonment and torture. “My maman would draw me pictures of her prison cell and tell me bedtime stories about her life during the revolution,” shares Soleimani. “My baba would talk about his actions as a protestor over dinner, while also talking about socio-political struggles around the world, not just localised to their experience in Iran.” Acutely aware of human rights violations at an early age through the explicit lens of her parents, “They didn’t want me to grow up and think that the world was an idyllic place, they wanted me to know the truth—and I think that’s one of the best things you could do for a child.” Expanding her investigations and ensuing artistic depictions to women killed under what she describes as an “eye for an eye” Sharia law system via online forums, Human Rights Watch, and the dark web, she soon faced threats from the Iranian government and militia. So, if there is ever the thought that Soleimani is tackling the plight of Iranian women without firsthand experience, she is one step ahead of you.